Emerging social enterprises from across the nation have been recognised at the inaugural Social Enterprise Awards in Melbourne - in a celebration of what has been deemed a new ‘movement’. Emerging social enterprises from across the nation have been recognised at the inaugural Social Enterprise Awards in Melbourne – in a celebration of what has been deemed a new ‘movement’. Winners were announced in five major categories. Thankyou Water took out the youth-led social enterprise category for the success its young team of co-founders has achieved by selling bottled water to bring clean, safe drinking water to people in developing countries. Streat, a hospitality, cafe-based enterprise which provides young trainees with work and life skills who are tackling homelessness or disadvantage, won the Social Enterprise Innovation Award. Awards MC, Mark Daniels, from Social Traders, said the night was not just about the winners but about everyone involved in social enterprise. “Social enterprise stars always shine,” he said. Social Traders received more than 100 applicants for this year’s awards. Twenty-four organisations were shortlisted. 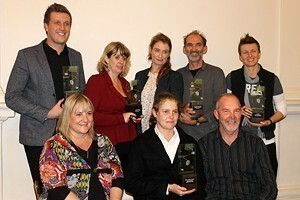 Industry players gathered at the Victoria State Library to celebrate the business models that ‘make profit for good’. Streat co-founder Rebecca Scott said it was only the beginning for the enterprise which still had a ‘long way to go’ in achieving its goals. “There are 4000 people who are homeless in this city,” she said. “We have only helped 60[people] so far so we have got a hell of a long way to go. Streat and Thankyou Water received tickets, flights and accommodation to either the Skoll World Forum on Social Enterprise or the Social Enterprise World Forum. Not for Profit capacity development organisation Connecting Up won the Small Social Enterprise award. Waste managing and recycling organisation Resource Recovery took out the award for medium-to-large Social Enterprise. Connecting Up and Resource Recovery won $10,000 for their successful business models. Great Lakes Council was recognised in the Social Procurement category for its work in providing employment for local job seekers who are disadvantaged through its contracts with Great Lakes Community Resources. Great Lakes Council won ‘respect, love and gratitude’ for its procurement program. Profit generation to be used to support community services.